allowing Sunshine River Tours show you this great natural attraction. 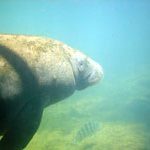 Sunshine River Tours offers Manatee Tours from November to March, and family fun Scallop Tours during the summer. Homosassa is a great place to visit in Florida and you can stay at Bella Oasis Hotel & Spa. There are not too many hotel choices here but this is good one for a night or two. On the way to attend a Sunshine River tour, you will discover Homosassa, a great small city south of Crystal River. “Homosassa” is a Greek word meaning “place of many pepper plants”. This rustic sea town has plenty to do and see, including Homosassa State Park and Homosassa River. Homosassa Springs State Park is one of the few places where you can be guaranteed to see manatees year-round. It has an underwater observatory, which provides a great viewing opportunity without getting wet; you can get within inches of a manatee! The park also has two bear cubs that frolic throughout the park. Coming soon, watch for the opening of Wildlife Walk Phase II with new habitats for cougars and bobcats, along with a new Wildlife Encounter Pavilion. My visit to Homosassa began bright and early at 5:30AM on a cool November day. I was instructed to meet the driver of the Sunshine River Tours van at 6AM. That morning the driver, and first mate, was Dolores, a friendly and happy person who arrived promptly. Dolores told us some exciting facts about the manatees, as well as Captain Mike Milsap, the owner or Sunshine River Tours. After we gathered 5 people from the highway 19 parking lot, Delores took us on a short ride to Captain Mike’s storage house to get wetsuits. Here we carefully picked our suit size in preparation for the brisk water. The water temperature is, on average, 72 degree, but when the air temperature is lower than the water, one really appreciates the use of a wet suit. Delores continued from the storage facility to the pick up point, where Captain Mike was waiting for us. Before we exited the van, we watched an informative video on what to do and what not to do when swimming with the manatees. We then made our way to the nicely refurbished boat, where there was plenty of room for 20 or more people. Nevertheless, Captain Mike prefers taking only 10 people at a time. The boat was docked in the old fishing village of Homosassa. state-owned Homosassa Springs Wildlife Park. As the river makes its way to the Gulf of Mexico, the water mixes with saltwater and becomes brackish. Continuing west, the Homosassa dumps into the Gulf amid many small mangrove islands and saltwater grassy flats. From the town, Captain Mike headed east up the river to Homosassa Springs, where we would find the manatees. A trip to the springs early in the morning is a necessity in early November, since the manatees head out to the Gulf of Mexico later in the day when the waters get warmer. As the season gets colder the manatees stick by the springs throughout the day because of the constant flow of warm water. West Indian manatees may be found in any waterway over 3.25 feet (1 m) deep and connected to the coast. They prefer water above 70 degrees F (21 degrees C). Florida manatees rarely venture into deep ocean waters, however, there are reports of manatees in locations as far offshore as the Dry Tortugas Islands, approximately 50 miles (81 km) west of Key West, Florida. Once we got to the springs, the sun began shining through the trees, and Captain Mike spotted the manatees right away. We got prepared to jump into the water. As the sun got brighter, it was easier to see the manatees. The entire group of manatees, about 4 – 6 of them, where busy having a vegetarian breakfast. Florida manatees feed on over 60 species of plants. These include turtle grass, manatee grass, shoal grass, mangrove leaves, various algae, water hyacinth, and water hydrilla. Manatees consume about 4% to 9% (32 to 108 lb. 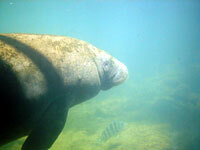 or 15-49 kg for an adult manatee) of their body weight in wet vegetation daily. These amazing creatures use their front flippers and large, flexible lips to manipulate vegetation. They have been seen drinking fresh water from hoses, sewage outfalls, culverts, and other fresh water sources and also congregating at river mouths. Most scientists agree that manatees must periodically have access to fresh water. We jumped into the chilly water, and I watched in marvel as these animals ate and swam. They started to swim down the river as they were eating. I tried to keep up with these large creatures, but they were more agile then I imagined. Florida manatees have been clocked at up to 15 mph (24 kph) for short bursts, but they usually cruise at speeds of 2 to 6 mph (about 3-10 kph) or less. Although manatees are excellent swimmers, the deepest an individual has been seen diving is 33 ft. (10 m). They normally feed no deeper than about 10 ft. (3 m) below the surface of the water. In contrast to whales and dolphins, manatees aren’t deep diving marine mammals. Therefore, manatees’ muscles don’t contain the high concentrations of the oxygen-binding protein myoglobin that is typical of other marine mammals. While resting, manatees can stay underwater for as long as 20 minutes, although the average interval between breathes for resting manatees is two to three minutes. More active and smaller manatees breathe more often. Ultimately, the morning was a huge success. We had a solid hour to swim with the manatees, before they started heading out of the springs and into the Gulf. Captain Mike had some delicious hot cocoa ready for us when we got back in the boat, which we were grateful for. We headed down the river back to the dock. On the trip down, we ran into a small pod of bottlenose dolphin. I was surprised at the fact that dolphins swim in fresh water. After following the dolphins for a while, Captain Mike gave an informative tour of the river and town. The town of Homosassa still has not been over developed like most of Florida. The result? Quaint homes border the river. There is a tiny island in the middle of the river that is inhabited by abandoned monkeys from a circus. This island was named, strangely enough, Monkey Island. The town maintains a small fishing culture, even as more and more tourism takes over.That evening we found Margarita Grill, a great local place to eat. The restaurant serves fresh seafood in a pleasant, patriotic atmosphere. All staff members wore American Flag clothing. In addition to its unique atmosphere, the food was reasonably priced. There are other attractions in the area. Weeki Wachee Water Park might be of some interest. It’s an older theme park that been around since the 50’s. The mermaid show might bring back some memories of the Little Mermaid movie. The park is in bad shape, but there is talk about putting some money into it for refurbishing. After spending a morning with Sunshine River Tours and Captain Mike I was able to enthusiastically say that I had an incredible experience in Homosassa Springs; an experience that I would never forget.